So let’s roll up our sleeves together, and take your organization to the next level. You still need your data. It’s always going to be an important tool in validating where you’ve been, and of course, operational data (like a customer’s address) is critical. Here’s what you can expect when working with me to improve your organizational decision making. Think of this as an “a la carte” menu; some organizations choose the whole bundle, some do one part at a time. Each has considerable value on its own. Decision intelligence training. I run half-day to full-week workshops on the core concepts behind decision intelligence. Here’s a typical course outline. Company-wide presentation, so everyone knows what we’re up to. Here are some videos of my public appearances, to give you a flavor of this. Decision-specific workshop. I typically work with a multi-functional team. We begin by aligning around desired business objectives, then proceed through decision specification, design (levers, links, external data, and more), and iterate. We work visually and collaboratively, and often the focus is understanding the links between previously silo’d groups, and modeling the “whack-a-mole” of unintended consequences. Data assessment. Usually, only 20% of the data contains 80% of the business value. The challenge is to determine which data contains the value. 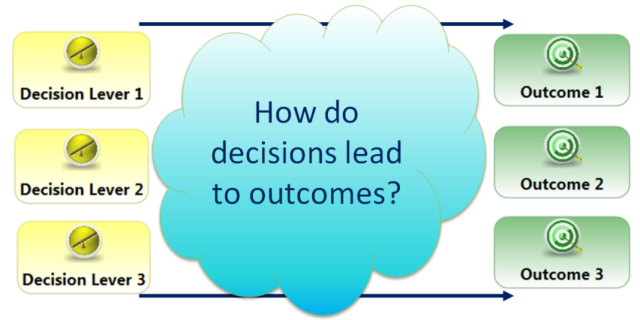 Decision intelligence provides a structured and rigorous approach to figuring this out. If you don’t take this approach, you can waste a lot of time managing data using “operational” methods, where less expensive “analytical” approaches are a tremendously better fit. Decision model implementation in World Modeler. You can get a lot out of steps 1-3, but implementing these concepts in an enterprise-class tool is where the big benefits start to kick in. Sometimes we begin by modeling in Microsoft Excel as well, and often we generate data that can be read by Excel as the model runs. Decision visualization. We usually build custom visualizations for our clients. You can see a few demos, here (for program management) , here (for data center risk assessment), and here (a full-CG decision model visualization). We build these to your specifications, to meet the needs of your team. Data and systems integration. Here, we work with your organization to integrate a real-time decision navigation infrastructure into your business. Our value proposition: “the best of both worlds”: using our World Modeler platform means that we can built solutions at low risk and lower cost and much more quickly than other companies (indeed, we once built a full bank risk analysis system in under six weeks). At the same time, it’s fully customized to your needs, as if we’d built it from scratch. Why this is possible? We’ve discovered what’s required in a general-purpose data and decision management framework, including optimization, data binding, visualization, simulation, and more (read our API documentation here). So please drop me a line, and let’s explore together whether supercharging your organization’s decision intelligence makes sense for you.